Don’t take me wrong: Linked files/folders and virtual groups are a great feature in Eclipse (see “Link to Files and Folders in Eclipse“). But as with any great feature, it can be misused or overused. I understand it is easier for the vendor to provide linked files and folder. But to use such a linked files/folder and virtual groups project makes it really hard to start my application and design. The problem with that is that as soon the project location gets changed, all the links are broken :-(. So while for the SDK it makes sense to share the GPIO driver, for any other usage of the project it creates a dependency which is hard to keep up. I rather want to have that GPIO driver inside my project folder structure. Unfortunately there is no magic button to transform a linked project into a normal standalone project. One obvious way is to create a new project and then copy over the needed files. Obviously that is a very time-consuming process. But what I have found is a process which makes it easier to transform a linked project into a standalone project. What I’m using is to ‘export’ and then ‘import’ the project again. 💡 That checkbox ‘Resolve and export linked ressources’ is present in Eclipse Neon or later. 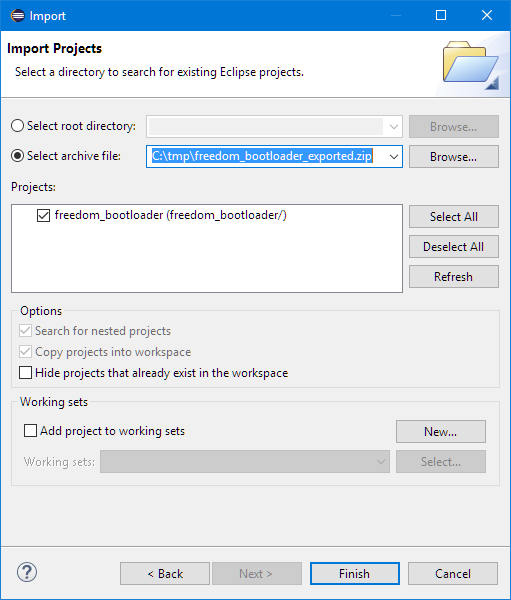 Earlier versions of Eclipse do resolve the linked ressources during export automatically and it cannot be disabled. The next step is to import the project again. 💡 Since it is not possible to have the same project name twice in a workspace, either remove the previous project or rename the project, or have it open in a temporary workspace. The other missing thing might be header files. 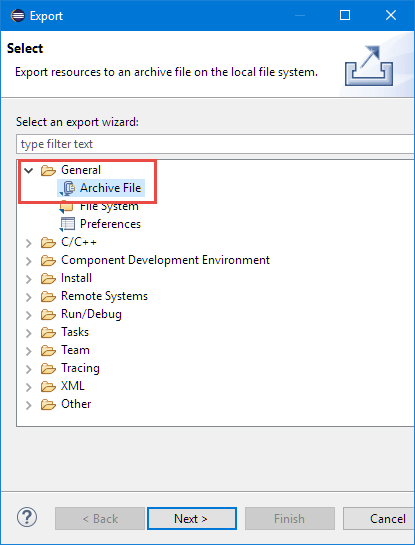 The export does only export the folders and header files which are present as links in the project. So there might be headers or include folders which are missing. Copy the missing files and folders into your new project. 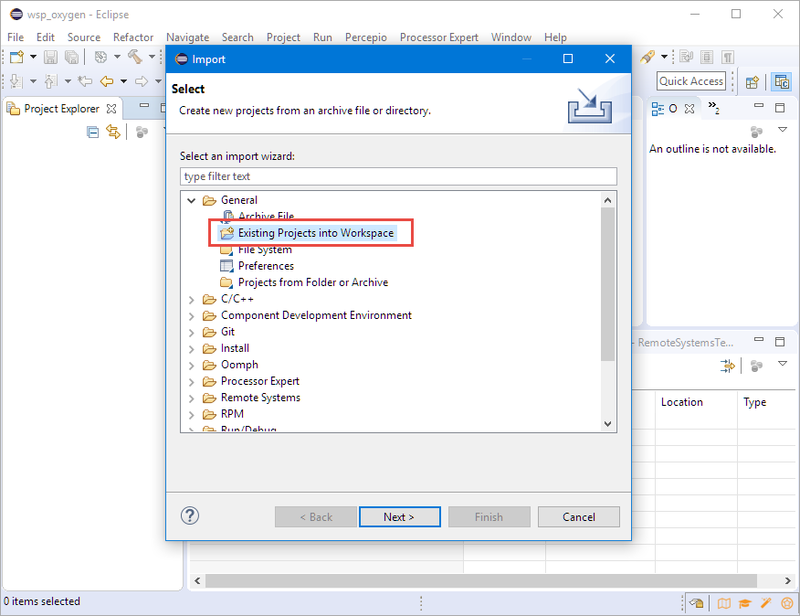 💡 It is a good idea to have the ‘linked’ project open in a separate workspace/Eclipse instance. So it is easier to find out where the missing files are located on the disk. Linked files and folders are a pain if such a project needs to be moved or changed. It is better and easier to have the files standalone and not linked. To transform a linked project into a standalone one, I use the trick to export it as an archive and then import it as ‘existing project’ from that archive. 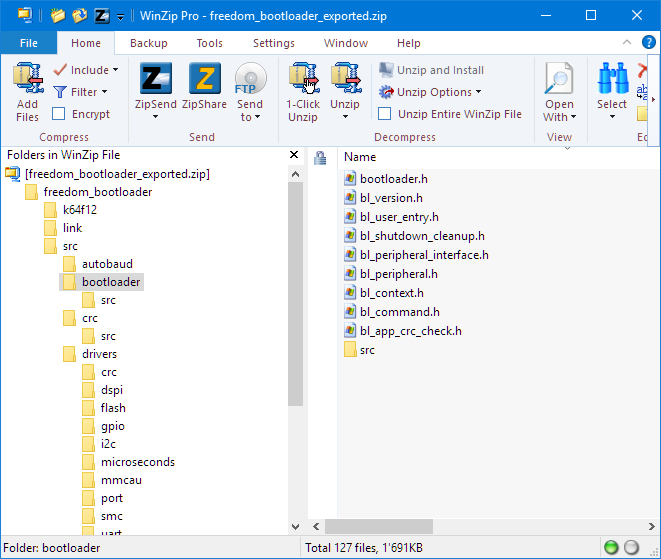 With a few more tweaks, I have a standalone project which is transparent with all the files and which easily can be moved around, passed to a co-worker or put into a version control system. 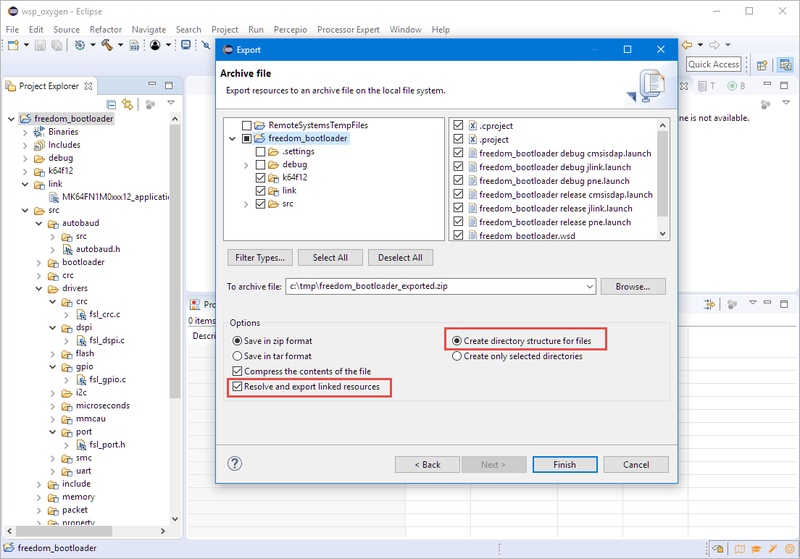 And the presented approach makes it easier to take a project out from of a complex and linked directory structure, and I can use the project in standalone mode, with only the needed files. 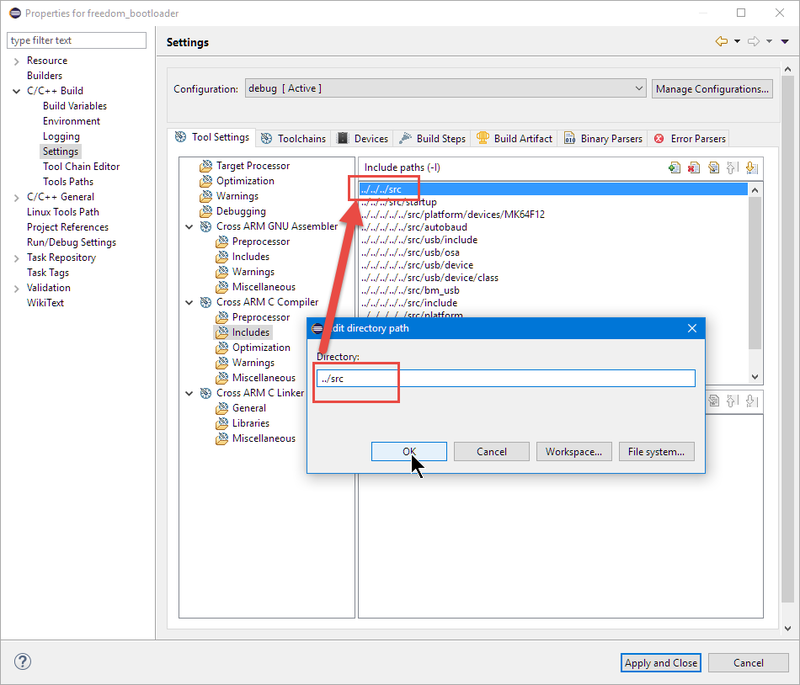 This entry was posted in Building, Eclipse, Tips & Tricks, Tutorial and tagged Building, CDT, Eclipse, Linked Files, Linked Folders, Projects, Standalone, technology, Tips&Tricks, tool chains by Erich Styger. Bookmark the permalink. thanks! And yes, I meant to open it up in a temporary workspace. As you, I don’t want too many workspaces created, but I always have a temporary/scratch one. I have updated that comment. Thanks for your input! thanks! I’m definitely interested and contact you. Thanks for sharing this article. It is useful. 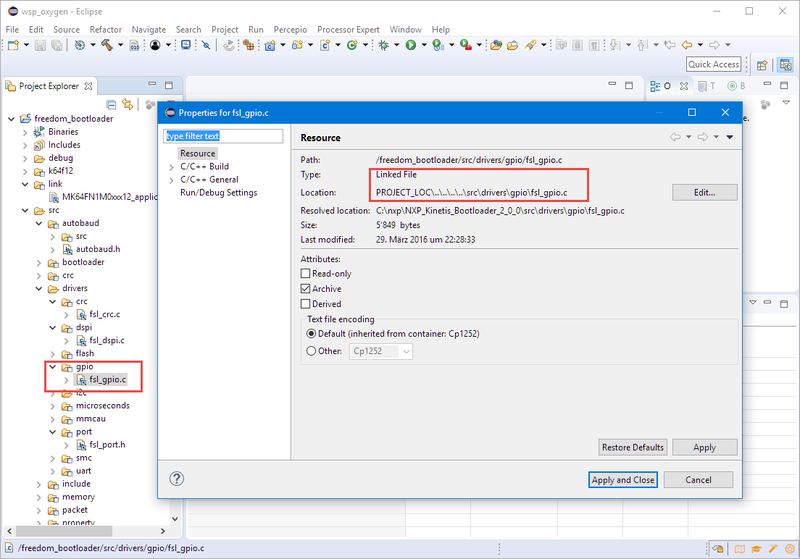 As a note MCUXpresso IDE automatically builds the project as standalone, copying all the required files. However I don’t find useful that it automatically generates the linker scripts (if the option for “managed linker scripts” is checked). I am also looking at building a bootloader based on KBOOT for the KL82. As a side note, the KBOOT (v1.5.1) comes in the ROM of the KL82. But I don’t see the point of it. Looks like they (NXP/Freescale) were envisioning another host that would flash the FW, via the ROM to onboard flash or QSPI. This doesn’t make much sense to me as this would add in complexity (another MCU potentially). 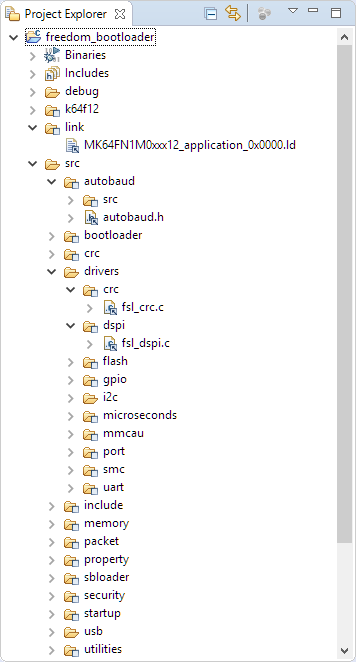 It’s much more flexible to have the custom bootloader resident in flash. Good timing, I’m working intensively with the KBOOT these days too (FRDM-KL03Z). 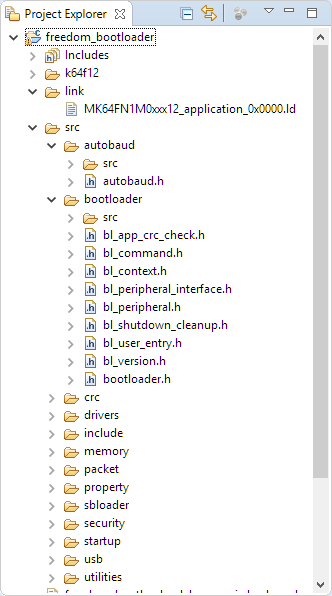 Actually I think that bootloader is very useful. Yes, there is some kind of host needed (say a PC) in the default case: bringing the board into bootloader mode, then connecting to the board say with the USB plug, then use the blhost command line utility (there is a GUI version too) to transfer the files. So you don’t need another MCU for that. There is another cool feature with the BusPal where another MCU can do that update. That is a good option in case my board has multiple microcontrollers on it, and one has USB (to a host): that way the ‘main’ MCU can update all the other MCUs on the board using I2C, UART, SPI, etc too. By the way i’m using default linker script that NXP KBOOT has made, didn’t changed anything. I would be really grateful if you can give me your opinion or solution to this problem. I might need a copy of your port/project. But this very much sounds like you are linking the interrupt vectors or the startup code twice. That’s why it reports that the interrupt region overflows. Search for ‘m_interrupts’ in all your files of the project, and I guess you have something in there tice? I solved the problem. You are right i had multiple startup code in my project. When i removed lt everything linked fine. Thanks for your reply.